Tim Cook addressed the White House Summit on Cybersecurity and Consumer Protection in February. In a speech to nonprofit research firm Electronic Privacy Information Center (EPIC) at its annual “Champions of Freedom” awards dinner last night, Apple head Tim Cook had some strong words about online security, government monitoring, and corporate data mining. Cook was the first business leader to receive recognition from EPIC, which lauded his “corporate leadership” on matters of maintaining Apple customers’ privacy. Cook is referring (unsubtly) to companies like Facebook and Google, who provide free-to-use services that collect massive amounts of user data. The Apple chief also had some things to say about encryption and government monitoring, which came just a day before today’s Senate vote outlawing the NSA’s controversial “warrentless wiretap” program. 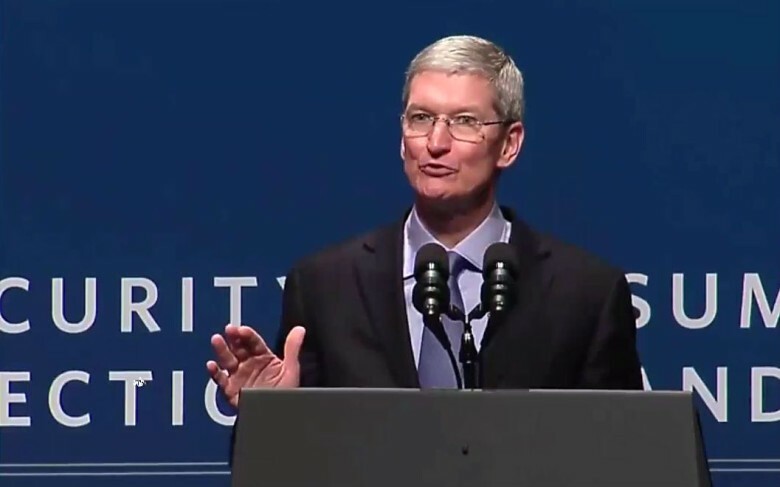 “If you put a key under the mat for the cops, a burglar can find it, too,” Cook said, citing government pressure for Apple to provide a “master key” that would officials bypass the company’s security measures. With these statements and policies, Cook is hoping to place Apple on the right side of history. The paranoia and complacency that allows programs like the NSA’s to exist is falling out of style, with users showing increased interest in protecting their data from unchecked government monitoring. Companies like Google are as open as they can be about the encryption of its data, but still admits that underencrypted chat programs like Hangouts are susceptible to law enforcement mandates. As officials, corporations, and the public struggle to establish the proper balance between security and privacy, the differences in public policy between Apple and its competitors becomes ever more pronounced. We’ll see if they stay that way, for good or ill.